Divine Chaos, Moyra and Joanne Millar! 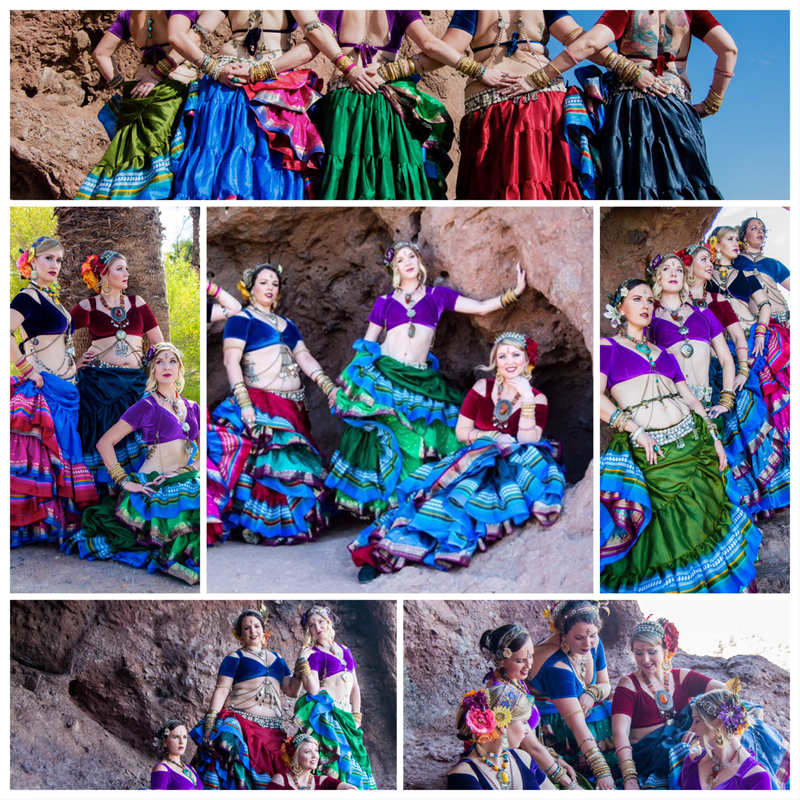 ​Divine Chaos Tribal® Fusion, LLC is an innovative Tribal Bellydance Company founded in 2008, and is directed by Shannon Conklin. Divine Chaos Tribal® is well known for their colorful flaring skirts, high-energy performances, and unique and innovative style. Divine Chaos Tribal® Fusion, LLC (DC Tribal Fusion) is an award winning dance company that is highly sought after locally, nationally, and internationally for workshops and performances. They regularly perform at various events ranging from community events to global festivals. Their unique and signature style of belly dance is a fusion of their favorite dance styles, from skirt dancing to Hip-hop to Bollywood. In 2012, DC Tribal Fusion released their first instructional DVD, Intermediate Tribal Skirt, to be followed in 2015 & 2016 with Volume II & Volume III within the sold out series. They also produce Phoenix Rising Dance Festival® annually. ​Moyra is a JWAAD accredited Egyptian dancer and teacher who can be found regularly teaching and performing in her home city of Edinburgh. She is one of the principle dancers in the dance company “Helwa”, based in North East England, who recently enjoyed a sell-out run in the Edinburgh Fringe 2018. Moyra regularly travels to Cairo and elsewhere to train and keep up to date with the latest trends and her aim is to introduce as many people as possible to Egyptian dance and share with them the joy that she gets from dance. In each workshop Moyra aims to give each participant something to suit their level and to inspire them to add into their own dance. Joanne Miller is an Egyptian style dancer and has been dancing for almost 10 years. Based in the North East of England and a student of Kay Taylor, Farida Dance. She has danced nationally in different theatres, and often performs in restaurants, parties and weddings. Her most favourite dance moment was dancing on the Nile Maxim in Cairo with Randa's band...what an amazing experience! Joanne is also a principle member of the Helwa Dance Troupe who recently performed at sell out shows at the Edinburgh Fringe Festival in 2018. Joanne has recently completed the JWAAD Teaching Diploma and has taught various classes and workshops, including at the Jewel of Yorkshire festival and Borwick Hall.